A few weeks ago, we had a bit of a wind storm here in Sacramento. Afterwards we discovered that nearly all the posts of our back fence had failed. I called around and got several verbal quotes yesterday. I needed about 75 linear feet of fencing installed, and most places were quoting me $1,000 to $1,500 for 4-foot high chain link fencing, not including removal of the old fence. One of the places I called, [All Fence Design] aka [All Steel Fence Design], was just finishing a job and offered to drop by my house to do a written quote, since it was right on their way. They quoted me $1,150 — not the cheapest, but far from the most expensive. They were using the same high-grade materials that the expensive places were quoting me, *and* they were willing to haul away the old fence! To top it all off, they’d had a job fall through so they were available the very next day. It sounded good to me, so I gave them a deposit on the spot, with work scheduled to begin at 7:00 am the next morning. They arrived about ten minutes early this morning and got right to work. After making sure they had everything they needed, I went off to my own job. I came home a bit early and they were just finishing up. Casey (between the open gate and the telephone pole above, with his back to the camera) and his crew did a great job. They got the fence installed in one day, including hauling away the old fence. Galvanized chainlink fencing isn’t a particularly aesthetic material, but these guys made it look great in spite of that. It was good workmanship, quality materials, and a fair price — you can’t ask for better than that! 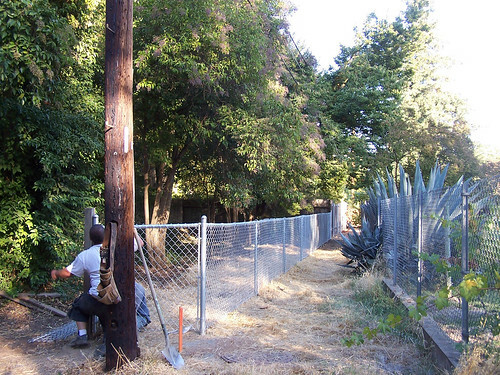 If you need fence work done in the Sacramento area, I strongly recommend that you get a quote from [All Fence Design]. 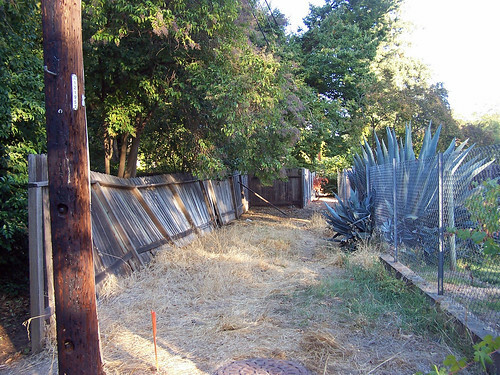 This entry was posted in Our home remodeling project, Uncategorized and tagged fence, review, sacramento, yard. Bookmark the permalink. the new fence to add a bit of a nature look in the setting that it is in. The job looks good and here in the Mid-South, the price is comparable to what you paid for it.